A clarifying week in Washington showed how ugly the war of oversight between President Donald Trump and House Democrats will become and dug new battle lines in the most intense exchanges yet of the 2020 campaign. House Democrats swung their investigative machinery into action in the most searching examination of the Trump White House so far, showing that the special counsel's probe is only one of the President's concerns. The administration and its allies made clear they will do everything possible to frustrate Democratic oversight efforts, in a way that will test the constitutional infrastructure designed to hold the executive branch to account. The President is already warning that the Democrats' use of Congress's constitutional prerogative to review and monitor his administration's activity adds up to an illegitimate attempt to oust him from office in the 2020 election. "The Democrats in Congress yesterday were vicious and totally showed their cards for everyone to see. When the Republicans had the Majority they never acted with such hatred and scorn! The Dems are trying to win an election in 2020 that they know they cannot legitimately win!" Trump tweeted on Saturday. Trump also pivoted toward 2020 in his State of the Union address on Tuesday, laying out his clearest thematic blueprint yet for his re-election bid. The President proclaimed that an economic "miracle" was underway and mixed scalding rhetoric on immigration with claims that Democrats are marching left toward socialism. And Democrats are blitzing early-voting states this weekend, reflecting their belief that a President under a legal and political siege could be vulnerable next year, despite his ruthless campaigning style. The most serious potential development for Trump came with the expansion of the House Intelligence Committee investigation beyond Russia, which likely means special counsel Robert Mueller's report will not end the President's political exposure. House Intelligence Chairman Adam Schiff announced that he would also look at whether any business ties between Trump and Saudi Arabia or any other nation were creating leverage over the administration's foreign policy. The move added another layer of peril for a President who is seeing his campaign, inauguration, transition, presidency and past business career under the scrutiny of civil, political and criminal investigations. It quickly became clear during the week that the commander in chief, who experienced only the most cursory oversight when Republicans ran both sides of Capitol Hill, is not enjoying his first taste of the new Democratic-led House. Trump sought to paint Schiff's move as the kind of "ridiculous, partisan investigations" he had decried in his State of the Union address on Tuesday night. He charged in a tweet that the California Democrat was poring through "every aspect of my life, both financial and personal, even though there is no reason to be doing so ... Unlimited Presidential Harassment." Other Republicans are beginning to adopt the line that Democrats are motivated not by fulfilling their constitutional duties to hold an administration to account but instead by their personal animosity toward the President. The top Republican on the House Judiciary Committee, Rep. Doug Collins of Georgia, told acting Attorney General Matt Whitaker on Friday he was simply a pawn in a Democratic circus as he showed up to testify. "No, we want to damage the President. We want to talk about your private conversations," Collins said, paraphrasing what he said was the Democratic strategy. "I'm thinking about maybe we should just set up a popcorn machine in the back, because that's what this is becoming. It's becoming a show," Collins said. The Whitaker appearance was in doubt up until Thursday night after Democrats voted to give Judiciary Committee Jerrold Nadler, D-New York, the power to subpoena Whitaker if he did not answer questions or show up. The standoff was defused only when Nadler said he would not present the subpoena to Whitaker on Friday. But reflecting the deep animosity between the Democratic-led House and the executive branch, he threatened to haul Whitaker back to the committee for a closed-door deposition -- even though Whitaker is likely to be out of a job within days, with William Barr expected to be confirmed as attorney general next week. 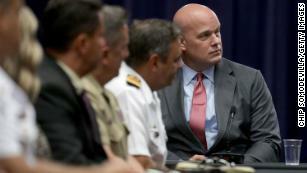 The acting attorney general's performance appeared to exemplify an apparent contempt for oversight in the executive branch. Whitaker often looked like he was performing for a President who checks up on his appointees on television, rather than seriously trying to answer questions. At one point, in an intervention by a witness rarely seen before, he reminded Nadler that his time for questions had expired -- risking the ire of the all-powerful chairman, who laughed off the impertinence. Despite prompting from Democrats on the panel, Whitaker refused to say the Mueller probe is not a "witch hunt" -- Trump's favorite phrase -- though he insisted he had not interfered with the special counsel. In another front of the House Democrats' investigations on Trump, another committee started the process of trying to force the President to reveal his tax returns, after he defied tradition in the 2016 campaign by refusing to do so. Rep. Michael Waltz, a Florida Republican, complained on CNN that the probe was a symptom of "runaway investigations on the President." But Ways and Means Oversight Subcommittee Chairman John Lewis of Georgia said Democrats were infused with a sense of mission. "We have to do the right thing. We are called to do the right thing, we have been selected, we have been chosen," Lewis said. Democratic Rep. Tom Suozzi of New York told CNN's Erica Hill that Democrats had to walk "a very delicate line" between genuine congressional oversight and over-exuberance. "You're on a nice edge of balance," said Suozzi. "You can't go all the way over here and you ignore your responsibilities of oversight. And you can't go all the way over here that you become political and you're going after the President because he's from a different party." In Washington, the focus is on the bitter fights about to unfold. Outside the capital, Democratic activists are looking ahead to what they hope is a different future, as their party's prospective presidential nominees conduct the most intense campaigning this weekend of their nascent race to date. Sen. Cory Booker of New Jersey was in Iowa on Friday, while his colleague Sen. Kirsten Gilibrand of New York headed to South Carolina. South Bend, Indiana, Mayor Pete Buttigieg was also in Iowa, while Sen. Sherrod Brown of Ohio, who is mulling a run, headed to the first-in-the-nation primary state of New Hampshire. Sen. Elizabeth Warren of Massachusetts hopes to shrug off fresh controversy over her claimed Native American heritage when she officially kicks off her campaign in her home state on Saturday. On Sunday, in Minneapolis, the crowded Democratic field could get another contender with Sen. Amy Klobuchar set to announce her intentions from her home state. Whoever emerges from the pack, Trump is already waiting. His State of the Union address was a response to a political moment when he is under siege on many fronts -- not least of them a duel over his border wall and government funding ahead of a deadline next Friday. But it was also a bold statement of his 2020 campaign strategy. The President indicated that his re-election race, like his 2016 strategy, would be rooted in inflammatory rhetoric over immigration aimed at his base. "No issue better illustrates the divide between America's working class and political class than illegal immigration," Trump said in an appeal to his blue-collar voters in the South and industrial Midwest. The President signaled that he will mix his populist rhetoric with a claim to have pulled off the most impressive economic renaissance in decades. He also sought to position Democrats as heading to a left-wing extreme: "Tonight, we renew our resolve that America will never be a socialist country." The President's attack on Democrats for embracing "socialism" was a sign that the GOP will seize on government programs on climate change, higher education and health care, advocated by rising stars like Rep. Alexandria Ocasio-Cortez of New York, to try to scare swing state voters. Conservative media and opinion pages were full this week of critiques of the Green New Deal cosponsored by Ocasio-Cortez, which would require a fundamental remodeling of the economy to eliminate fossil fuels. In his State of the Union speech, Trump was also careful to take care of another sector of his 2016 coalition, evangelical voters, on another issue the GOP hopes to use to portray Democrats as marching away from the American mainstream. He accused New York Democrats of passing state legislation that would allow "a baby to be ripped from the mother's womb moments before birth." He was referring to a new law that eases restrictions on late-term abortions if the woman's life or health is at risk. The State of the Union was a fresh indication that after refusing again to broaden his base, as many presidents do in office, Trump will seek to route a road back to the White House similar to that he forged in 2016, which defied pundits who believed it could not be done.